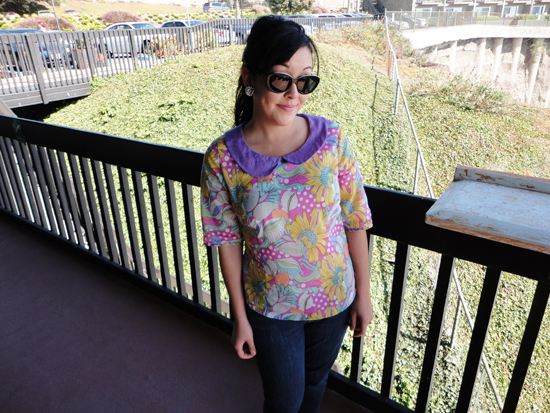 On Saturday morning I finished my Alma blouse just in time for a lunch date with my love. We lucked out a couple of weeks ago when a customer gave us a gift certificate to Ventana Grill, our favorite local restaurant! We decided to use it ASAP and get cocktails and a nice lunch. 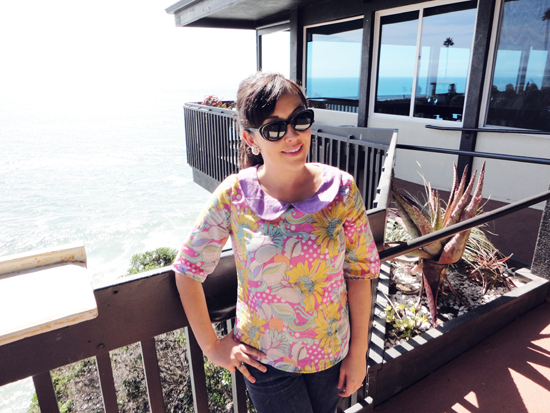 We were starving when we got there, so I asked Luke to take photos of me wearing my new blouse after lunch. Of course, during lunch he got a bunch of work calls and we had to leave quickly, so he only took a couple of photos of me. The lighting isn't the best in either of the pictures and I look pretty windblown, but whatever, I just had an amazing lunch and I got to wear my new Alma! They have a good selection of cocktails. 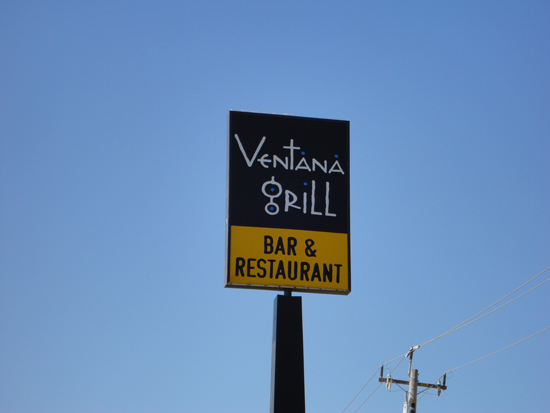 My drink (left) was the Ventana View and Luke had the Jalapeno Margarita. Both were amazing. Oh, the view wasn't too bad either, I love where I live! I wish I was there today, as the temperature is over ninety degrees and I am melting. October seems to have the warmest days for us. Back to the shirt, I made View B and I am happy with how it turned out. I ordered this cotton voile from Mood and wasn't too sure about it, but once I paired the collar with it, I loved it! The fabric is very lightweight and perfect for a hot day like today. Invisible zipper. Oh, I'd like to say "thank you" to Rachel for helping me with the fit. I asked for help on Instagram and she gave me some advice. I ended up adding 1.5 inches in length and it took away the wrinkles that I was having an issue with. We live a world apart and she gave me fitting advice. Isn't technology great? I love the colors- this pattern has such a great shape. Thank you and I agree about the pattern! 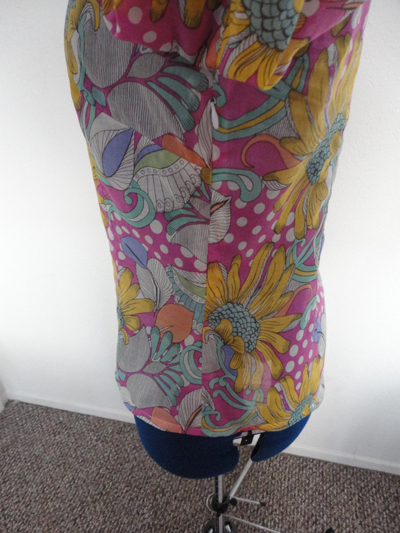 It was a straightforward sew and I want to make more shirts! That is awesome! So kitchy, and so fun! Very cute blouse Erin! I love all those colors on you. And the solid collar is brilliant--it really stands out that way. Thanks, Qui! I wasn't sure about the collar until I saw everything all together. I'm getting thirsty just thinking about them!! :) Thank you! 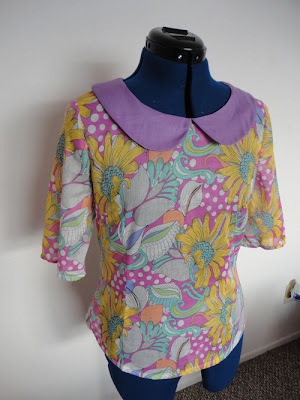 Love that fabric paired with the purple collar. Super flattering on you! So cute! I adore the look paired with your jeans - such great everyday style! 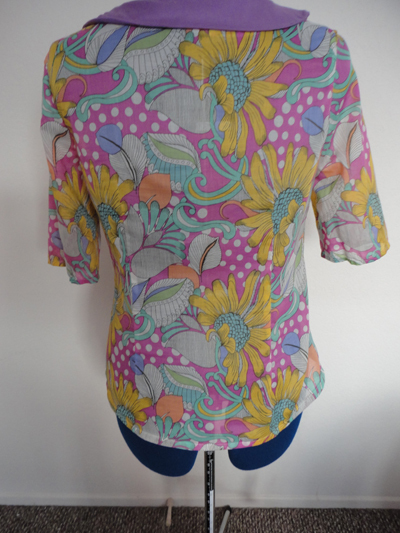 I totally dig crazy prints like this and adding a little splash of contrasting solid really ups the ante. Fabulous blouse and cheers for great cocktails! Thanks, Rochelle! I was glad that Rachel's fitting advice worked for me! this blouse is so fun and cute!!! What a perfect day date indeed! It looks like it fits well :) It looks so playful and cute! 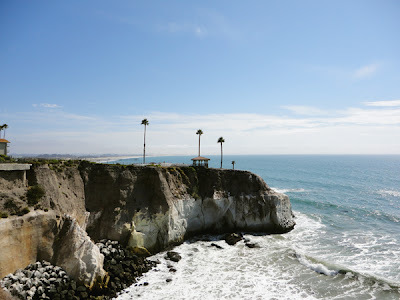 Gorgeous alma + cocktails + ocean views? I'll have you know I'm reading this from my tiny study and am filled with a burning jealousy! But seriously, you should make a gazillion Almas because you look super cute in that blouse. I get super jealous when I see all the beautiful places you go to! I love the print/colors you chose for this! They look amazing on you. Such a fun blouse! And good lord - that view!! How do you manage to get anything done? I'd just be sitting on those cliffs all day!! I wish I was there right now! I actually wanted to go out on the cliffs and take pictures, but we didn't have the time. My friend wanted Luke and I to get married there haha. What a sweet Alma, love it! And the location of your lunch date is stunning...I'm so jealous! LOVE this! It's so '60's and cute! So sweet!